Kids are becoming obese at earlier ages and staying obese for longer. We’re taking a design thinking approach to building a social enterprise to tackle this problem. We’ve got an idea. 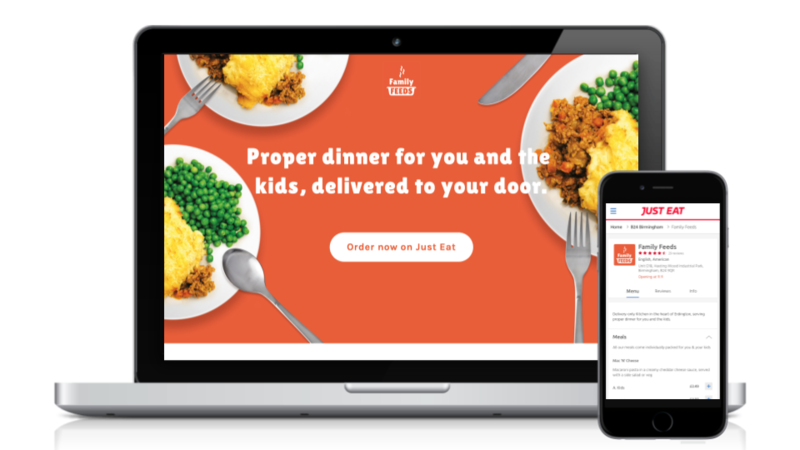 It’s an alternative takeaway service that delivers proper dinners to young families on a budget who are tired of the same old takeaway. Check out part one of this blog to find out how we got to this concept. Read on to find out how we validated it. Before jumping ahead and spending a fortune building a new takeaway and bringing it to market, it was critical to ensure market demand. For us, this meant testing three key hypotheses – parents are interested in our concept of “proper dinners” as delivered takeaway, they are willing to purchase and we can achieve high satisfaction. What’s the fastest and cheapest way we could test whether parent were interested in our concept? That was the question on our mind and we had a plan. Instead of opening a takeaway, we were going to setup a Facebook ad campaign and a website landing page to qualitatively assess potential sales conversion rates. First we needed to figure out how to describe our concept to parents to give ourselves a decent chance of public engagement. We tested 20 different consumer-facing descriptions, informed by the need states of our users – read more about that in the first part of this blog. These ran live on facebook for two weeks and linked to our landing page so we could measure the click through rate (CTR) of every ad in comparison to each other. Using CTRs is this way was helpful in staying user-centred. We didn’t pick the description that we liked most, we picked based on quantitative user behaviour. Armed with a working consumer-facing proposition, we could move on to testing parents’ interest in the concept. We continued using the same lightweight testing approach with the facebook ads, but this time, we extended our landing page to be a mock purchase flow. 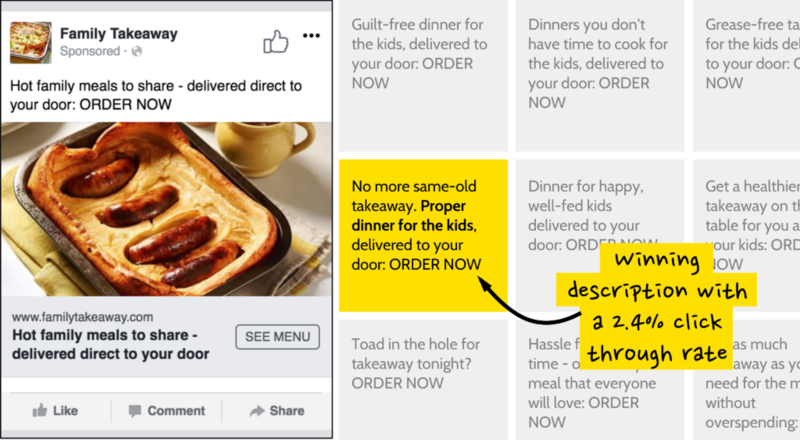 This meant that potential customers clicking on our Facebook ad would come to our website, choose the food they wanted to order for delivery and add it to their basket. Tracking this online ordering behaviour meant we could start to gauge parents “willingness to pay”. Obviously, we needed to take the results with a pinch of salt. But our confidence started to build when we calculated that we reached 129,066 parents with our Facebook ads, 2,491 of those clicked through to our site and 139 parents made a “purchase” (that’s after an assumed cart abandonment rate of 68%). A conversion rate of 5.6% wasn’t bad. This gave us impetus to see if parent would actually hand over money. A key indicator of market demand is customer traction. This brought us on to test our second hypothesis – seeing if parents will hand over real money and whether we can reach our target audience – young families on a budget. To do this, we set up a full service prototype in Birmingham for 10 weeks. We rented a commercial kitchen, partnered with a food manufacturer to source family meals, hired a kitchen manager and delivery driver, set up as a business on Just Eat, created a website and Instagram page, distributed over 3,000 flyers, got some local press and started taking orders from real families. Essentially, the same as any new business would promote their opening. We’re seven weeks into our 10 week prototype (the day of this posting). We’ve delivered 90 takeaways and our order volumes are growing slow and steady day by day. We’re also reaching the families we intended to reach. With 35% of our customers being young families on a budget who frequently order takeaway, giving an indication that they may be substituting one of their usual takeaways for ours. On top of that, we’re reaching 38% older families and individuals. But do they like it? 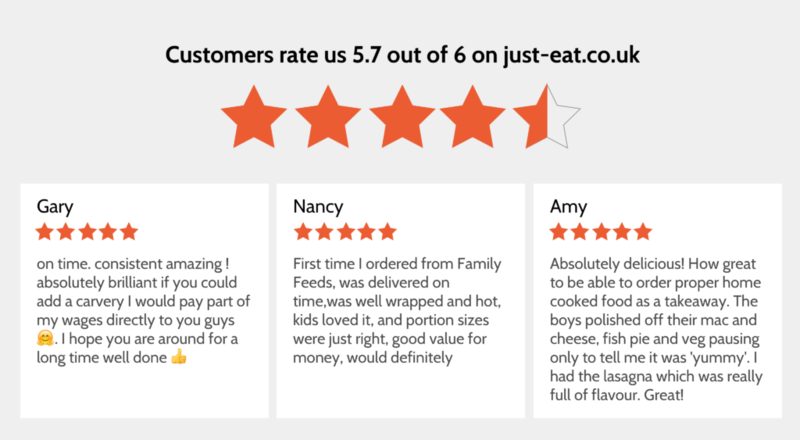 With a Just Eat rating of 5.7 out of 6, a review conversion of 28% and a monthly repeat order rate of 14% – we can say yes, parents are liking it. Check out some of our live reviews below to see what they’re saying. The insights from this process have given us confidence that there is market demand for our proposition. Now, it’s about identifying the right business model to achieve scalable impact – before we move on to pilot as a validated social business. If you want to learn more about our innovation design process and how we build social ventures at Shift, get in touch with Louise. By Louise | September 11, 2018 This entry was posted in Design Thinking, Poor diets, Young People. Bookmark the permalink.